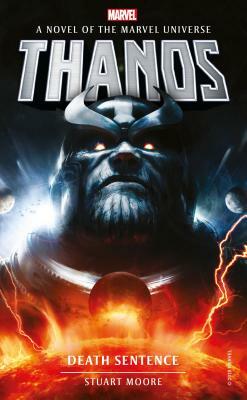 The Seventh title in Titan Books' Marvel fiction reissue program, featuring the Thanos story, Death Sentence. Thanos' pursuit of the Infinity Gems has always defined him. But when the Marvel heroes defeat him once again, Thanos' beloved Mistress Death grants him one final chance. Stripped of his powers and his old skin, Thanos embarks on a cosmic walkabout to reassert his power over himself and the Multiverse. Haunted by family - or the semblances of it - the Mad Titan may become something else entirely. Will he maintain his illusions of grandeur, or is this a new path for a lost god? Stuart Moore is a writer, a book editor and an award-winning comics editor. His novels include the New York Times bestselling Zodiac Legacy series (with Stan Lee, from Disney) and Marvel's Civil War. Current and recent comics writing includes Convergence: Superboy and the Legion (DC) and Dominion: Last Sacrifice (Amazon/Jet City); he has also written several original science-fiction projects, including the acclaimed EGOs (Image Comics). Moore has served as editor of the Virgin/SciFi Channel comics line, the Marvel Knights imprint and DC's acclaimed Vertigo line, for which he won the Eisner Award for Best Editor.